This photograph was taken earlier today in front of the White House. It’s a march of supposedly military veterans protesting the closure of the federal government. It was led by Republican Senator Ted Cruz and Sara Palin. And check out that Confederate flag. What is up with that design? Thought it was a version of the flag for the Tea Party. Thanks. 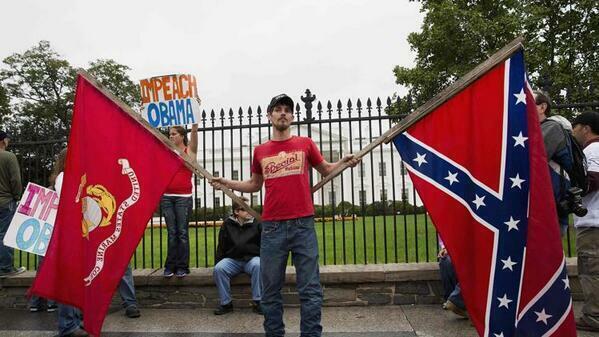 Does the Tea Party have a flag that symbolizes their solidarity? The Gadsden Flag is widely used at Tea Party rallies, and at this point is widely seen as an identifier of that movement. You can see at least two of them in the picture at top. Quick story: I bought one of these in a Gettysburg souvenir shop a few years ago, along with a 34 star flag. I thought it would be neat to have a Rev War era flag to go along with a Civil War era one. We hang them in our backyard when we bbq. The thing is, I did not know at the time that it had been appropriated by the Tea Partiers. I still hang it up occasionally, switching between the two, but I always feel sheepish when I do. My wife says it’s our way of taking the flag back. My wife says it’s our way of taking the flag back. I have been at Revolutionary War sites which flew the Gadsden flag for decades without comment which now get a lot of nasty remarks about the Tea Party. Oddly, among the Irish, being called a “snake in the grass” is an insult, and a “grass” or “supergrass” means a spy or informant from the “snake in the grass” root. The uses and misuses of history is fascinating in and of itself. 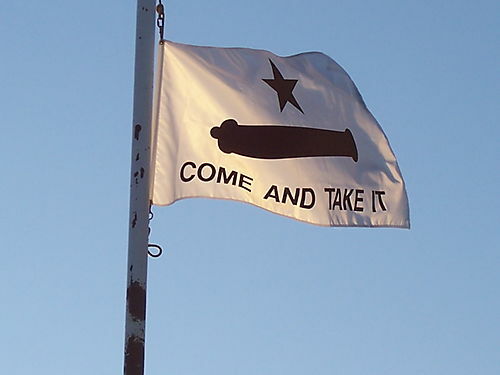 Same deal here in Texas, where the famous Gonzales “Come and Take It” flag from 1835 has been appropriated for Tea Party/2nd Amendment protest. So a Texan born in Canada to a Cuban father and a Delaware mother (and yes he is a natural born U.S. citizen) and an Idaho-born Alaskan led this march? I’d say their role was more pointing the direction rather than leading or organizing. Interestingly, while Cruz is a US citizen by birth jus sangre, if you accept birther theory, he may not be a natural born citizen. While we know what a citizen by birth is, there is a lack of case law defining what a “natural born citizen” is. There are several “birther” beliefs about the meaning of the “natural born citizen” requirement that are obscure to those outside that large cult. Some hold that if a person is the child of an immigrant one cannot be a “natural born citizen” because of potential dual loyalties. They base this on the 18th Century writings of Vattel, the Swiss theorist who worked for the French monarchy. A second block on Cruz from “birther” theorists is more arcane, and filled with racial venom. This is that the qualification for President is that a person be a “natural born citizen” of the United States, and that the 14th Amendment changed only the qualification to be a “citizen” but not a “natural born citizen”. Hence, the 14th Amend. did not change the qualification to be president when it was ratified, and only those persons who would have been viewed as qualified “natural born citizens” in 1787 are qualified today to hold the presidency. Of course that would potentially mean that non-whites, women, and Native Americans would not be qualified. And anyone born outside the original 13, if they really get that literal about it, true? It is funny. If you ask Americans why only “natural born citizens” can be president, they rarely have a good answer. After all, every other office of the United States government is open to naturalized citizens. It is illegal in every other context to discriminate between the naturalized and the native-born citizen. So why is the presidency different? As I wrote a few years ago, I would suggest that the framers were right to require that only natural born citizens be president, but that this requirement has outlived their purpose in creating it. There were rumors afoot in 1787 that Jay and other American “aristocrats”, who were derided as “Anglomen” by radical democrats, planned to invite the son of the English King George III to assume the presidency. The prospect of Prince Frederick Augustus, scion of the hated George III, becoming president was used in propaganda claiming that the wealthy sought to annul the gains that the Revolutionary generation had shed its blood for. And so, historians believe, Jay felt a special need to lay these claims of Anglomania to rest by barring the importation of the president. Today, such fears seem bizarre. But let us recall that when the Constitution was drafted, America was a weak and vulnerable nation of five million inhabitants. The British Empire still reigned in Canada, and France and Spain had substantial forces to the south of the new republic. In Europe, it was traditional for such threatened nations to import a foreign noble with powerful connections to rule over and defend the weaker country. And as recent subjects of the British King, the Americans knew that even the powerful English had imported three different foreign dynasties in the previous two centuries to rule. The Stuarts from Scotland, the House of Orange from the Netherlands, and George III’s own House of Hanover from Germany had successively run British affairs. They often appointed ministers similarly imported from their native lands and they entwined England in wars with more relevance to Germany or Holland than to Britain’s interests. The framers did not want America to follow suit. Had mere xenophobia been involved, the framers would have excluded all foreign-born persons from the presidency, but they did not. Article II of the Constitution allows anyone who was “a Citizen of the United States at the time of the Adoption of this Constitution” to serve as president. This was inserted to specifically allow foreign-born persons living in the United States in 1787 to become president. Then-prominent leaders like Alexander Hamilton, James Wilson, and Robert Morris had all been born outside of what would later be the United States. Wilson, who is little remembered today, was James Madison’s principal ally in the fight for the passage of the Constitution, and it was he who insisted that the foreign-born be allowed to be president, at least until the founding generation died off. The United States is no longer in danger of importing a foreign potentate to assume the presidency. We have a vibrant democratic tradition and we don’t look abroad for men on white horses to lead us out of our crises. We also have millions of U.S. citizens, raised in this country, who were born somewhere else. Perhaps it is time that we reconsider what my teacher said to my class of native-born and immigrant children 45 years ago: “America is a place where anyone can grow up to be president, except for those of you born outside this country”. This is what I thought when the objections were raised to Obama and I feel the same now when they are raised against Cruz. I have tried, in vain, not to listen to closely to the news this weekend. Reason number 497 for today’s migraine, I guess. LOL. I did catch a few items in passing from various talking heads. Did anyone else find it rather ironic that the individual who took it upon himself to mow the lawn at the Lincoln Memorial was carrying a SC state flag? SC, of course, being the first state to remove themselves from the Union because of the election of Lincoln. Hmm, interesting. Then there are the people who are losing their sustenance, literally their WIC and so on, when someone pointed out that people are spending up to 75% of their income, even after working 80 hours a week, on rent, but these yahoos find it more important to demonstrate over a situation that they themselves created. I’ve been reading a few foreign online papers of late. We are really causing concern throughout the rest of the world but moreover, we are fast becoming more of a laughingstock. I think it’s clear that our elected representatives do not respect those of us they represent. I heard the results of a poll on the radio this weekend and they were that most Americans are neither conservative nor liberal and are not particularly religious and that they certainly do not go along with the actions of the Republicans, which begs the question, exactly how did they get a majority in the House? I know, stupid question. I think the epitome of chutzpah is that the very people who are responsible for shutting down the government–including their precious veterans monuments–are the ones now protesting so loudly about the monuments being shut down! No negotiations are necessary; the House majority leader simply has to allow a vote on the continuing resolution to proceed–which he refuses to do. By all tallies, there are enough combined Democratic and Republican votes to make all this nonsense go away instantly. Apparently the majority no longer rules in the House! So the birthers, teabaggers, flaggers and every other crackpot to the right of Lincoln Rockwell are now blaming the White House? Off with his head says the Red Queen (Palin). What rabbit hole have we all collectively fallen through? I could not agree more. Thank you. And Palin…well…I choose not to use profanity on your blog. I posted this at Brook’s place as well, but I have a semi-serious question for the leaders of this “movement” – in the event of a slip-and-fall at a public facility, even one that is posted closed for whatever reason, there’s always a question of liability. Given that the USG has the deepest pockets around, some attorney will file the case, and the court system and the defendants will have to deal with it. Be nice if someone would ask the legislators arguing for these facilities to be open sans staff are willing to assume the liability themselves, rather than expect the taxpayer to foot the bill. The worst part of this is that it looks like Congress is going to hold hearings calling the NPS on the carpet after the shutdown ends. That is what they are calling for. Tea Party leaders, including Senator Cruz, have spoken out against domestic use of drones, and many Tea Partiers are better than President Obama on the subject of surveillance, at least in their rhetoric. At the same time, protesting temporary barricades at theWorld War II Memorial in the name of liberty seems rather absurd at a time when every single American is having their phone records and Web behavior monitored by surveillance agencies, laptops and other electronic devices are being seized without even the need for reasonable suspicion at airports and other border crossings, whistleblowers are being persecuted for telling the American public the truth about surveillance, and the NSA invests more money to further increase its activities. A closed memorial is the thing that gets these folks most riled up? Seriously? What I think, when I see that memorial closures are the thing that gets conservatives in the streets, is that movement leaders and rank-and-file activists alike cannot be counted on to identify and take on the most serious issues facing veterans, or the most serious threats to liberty. Instead they spend their time seizing on symbolic issues that promise to result in the best optics for a given news cycle — World War II veterans traveled to Washington and can’t visit the memorial dedicated to them! Think what victory would mean in this instance: the barricades would come down, which will happen anyway as soon as the government reopens. In other words, there’s no substantive upside for this particular rally, whether you’re concerned about benefitting veterans or safeguarding liberty.. It was held so that Cruz and Palin could aggrandize themselves, so that conservatives could revel in their self-image as liberty loving patriots who honor veterans, and so that the Obama Administration would look bad. Protests are nothing more than political theater for these people. Or if they actually intend to effect change, their strategy verges on nonsensical. Ultimately, poor organization, an over-zealous manifesto and even the weather appear to have undermined the Ride for the Constitution, making it a non-event in the nation’s capital. Yeah, he pretty much nailed it. I also had no doubt that the “Truckers Ride” would be a bust. Talk about a bunch of yahoos and that’s being kind. I drove up to Knoxville from Atlanta on I-75 Friday afternoon. I saw some people standing on an overpass waiving American flags and holding “Support the Truckers” signs. I tried to get a passing cell phone shot but…alas….no such luck. Based on the reports, I now believe that small “support the truckers meeting” was more of a success than the actual protest in D.C. This conservative most decidedly does *not* resemble that remark. I guarantee that most conservatives, including this one, are *not* reveling in the afterglow of this fiasco. We are embarrassed by it. The fact that the attendance was a bust says something. I wish I could say that the cockroaches came out of the woodwork, but that would be an insult to cockroaches, which typically have much better attendance. Unfortunately, anyone who is looking for any excuse to tar and feather all conservatives as tea-party fanatics now has it in spades. I wish more conservatives had the courage today this. Thanks for speaking out. We’ve had real conservatives for years who would never think of shutting down the government or taking us over the cliff. This is all about a distinct irrational modern ideology combined with demagoguery. Thank you for your encouraging remark, Kevin. 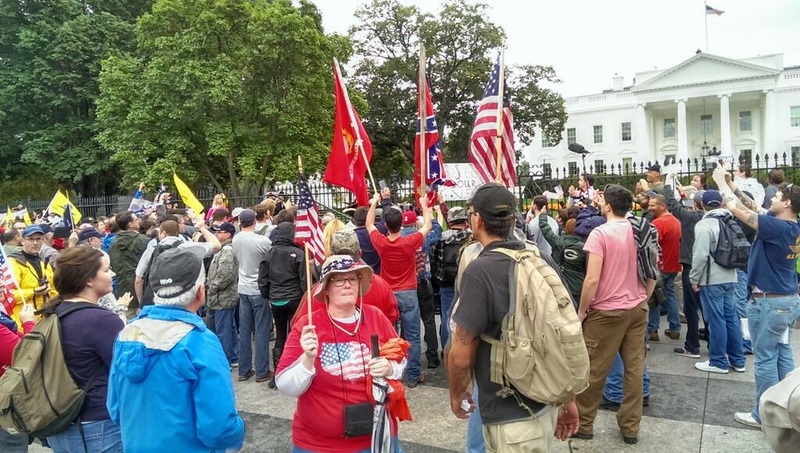 It really galls me that any Republican would allow anyone to display a Confederate flag at any Republican-associated gathering. It represents the murderer of the first Republican president, for goodness’ sake! Ambrose Bierce nails it again. Ah, Bierce — a Civil War veteran with no use for the romanticism of war or manipulative appeals to superficial patriotism. Yes, he is one of my favorites. He would have a field day with the fiasco. Now it seems that the far right wants to replace existing evils with others, too. “George III’s own House of Hanover from Germany had (successively) run British affairs.” Not your main point, of course, but a surprisingly common misunderstanding. Parliament chose George I in order to advance its own power. The last Stuart monarch, Queen Anne, like her predecessors had presided at cabinet meetings. The point of George I was that he couldn’t speak English. At his first cabinet meeting he couldn’t understand what was going on, and never attended another. That ended the direct involvement of Kings in British government. (This is not to suggest that Great Britain was any sort of democracy – Parliament represented the owners of the country). FYI, if anyone is tempted to claim the flag guy was a “liberal plant” the blog Little Green Footballs ID’d him. He’s a real right wing redneck Texan. Do you mean that grass and Snake in the G are not normal American English? It’s generally understood in Britain that “Grass” comes from the expression “whispering grass”. Well, if you think that Senator Cruz, a hero of the Constitution, is in any way a neo-Confederate, then I am afraid that you do not know much about him. Senator Cruz is the furthest thing from it.